Solitary Extraction - "Tape Deck Orchestra"
Brad Weber, drummer extraordinaire for the Ontario based group Winter Equinox is far, far more than just a drummer, as he aptly proves on his third solo outing, Tape Deck Orchestra. While his percussive skills are still in evidence, many of the songs on Tape Deck Orchestra are built around multi-layered strummed and picked acoustic guitars, but they are full of both spacey and sequenced electronics, intriguing soundscapes, something that sounds like a glockenspiel, and lots of fascinating, homemade, cut up samples. There's actually an almost folksy feel to many of the tracks, especially the few on which Brad sings as well. But this is not loose, psychedelic folk...Weber's creations are precise in nature, the playing spot on, with well thought out structures and gentle and often beautiful, evocative melodies. But the structures he utilizes are definitely not the typical verse/chorus type structures of conventional song writing (with the exception of, perhaps, the gentle acoustic/electronic pop of Memory Lock, which has a gorgeous chorus of three melodic vocal lines). But the rest of the album explores much less conventional structures. Take for example, the excellent Maps and Climate Change, which begins with a buzzing drone and polyrhythmic percussion, dips into a soft interlude of glockenspiel before a strumming acoustic guitar enters the picture as the glockenspiel continues its haunting melody. A multi-tracked vocal adds another melody, singing a verse, but no chorus, before layered acoustic guitars, picked melodies and complex percussive rhythms build to a striking climax...all in just over five minutes! In fact, that's the kind of thing you'll hear throughout the album; each track is a sort of complex, mini-symphony. 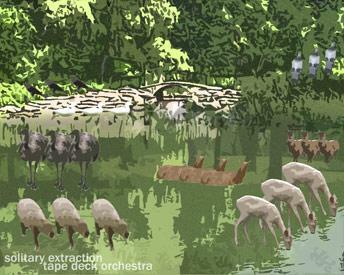 And that makes Tape Deck Orchestra a brilliant, and ultimately very descriptive title. I struggle a bit to find other artists to compare the music on this album too. Certainly you can hear dashes of bands like Air, Stereolab, and Tortoise, but that doesn't really capture a complete picture. The fact is, Brad Weber has crafted a truly original work here, a precise and electronic, yet warmly acoustic and organic musical foray that is pure listening pleasure from start to finish. Highly recommended! For more info you can visit the Solitary Extraction web site at: http://www.solitaryextraction.com. Visit the Crony Records web site at: http://www.cronyrecords.ca.